"Two steps of climbing up and one step of sliding down." 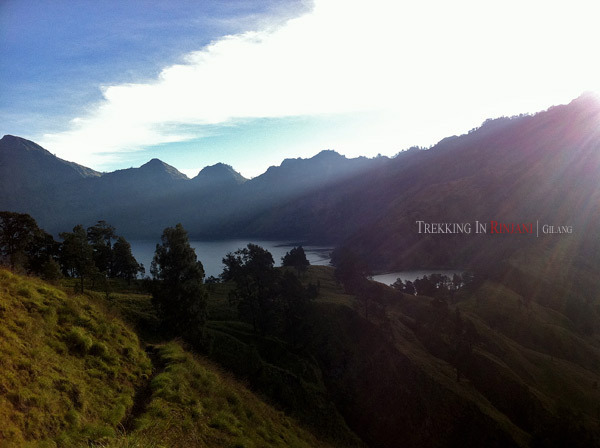 That was how most trekkers in Rinjani pictured the "summit attack." 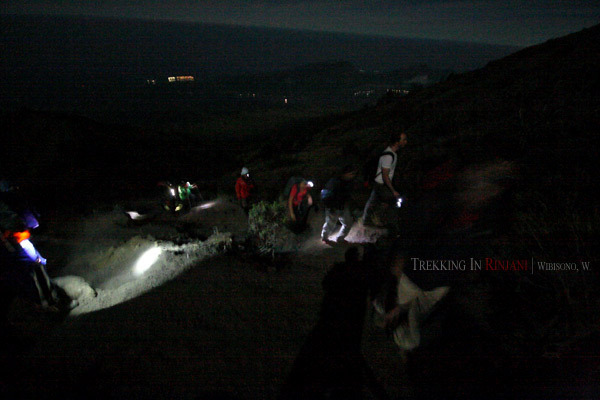 It’s an activity of reaching the highest point of the mountain, climbing an extremely steep path which was dominated with sand and stones. I had heard those words long before the day we were scheduled for the activity. Yet, I was a bit terrified when the day came for us to do that. 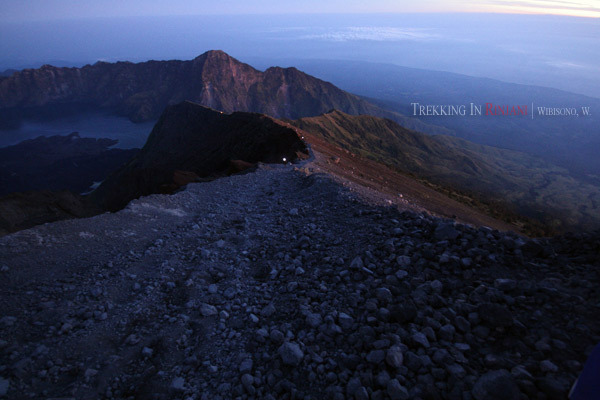 Soon, Gilang and I put on our shoes, grabbed the head light and rushed out from our tent. It was very cold outside. Patrick and Karen wisely decided not to go and stay at the camping ground as they were still exhausted from the first day trek and wanted to save the energy for the next one. Syaiful led us up the rocky hill with a narrow path. I felt like climbing up a stair with huge steps. It was really took my breath away. At one point where we found a flat ground, we stopped for morning prayers. From this point, we could see clearly how steep the slope we were going to climb was. I sensed it was about forty five degree gradient or even more. It was dominated with rocks and sand. 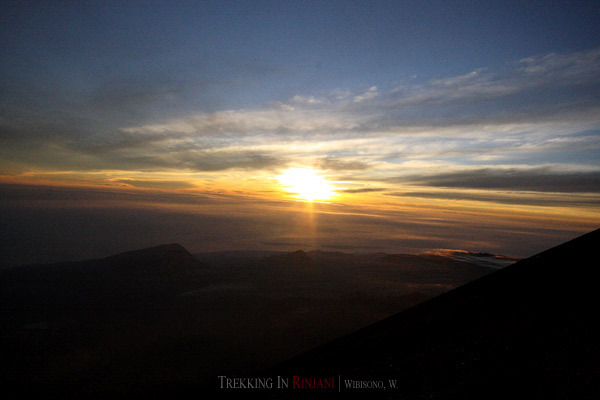 Gilang had an idea to quit, thinking that the sunrise could already be seen clearly from the point we were standing then. 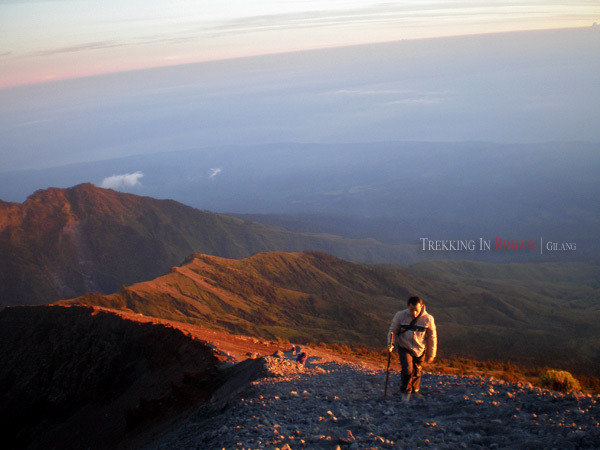 I suddenly had a flash back in mind that took me back to two years earlier when I went to Ijen Crater with my friends. While we were climbing down the crater, trying to reach the bottom, we decided to quit as it was drizzling that caused slippery on the stony path. 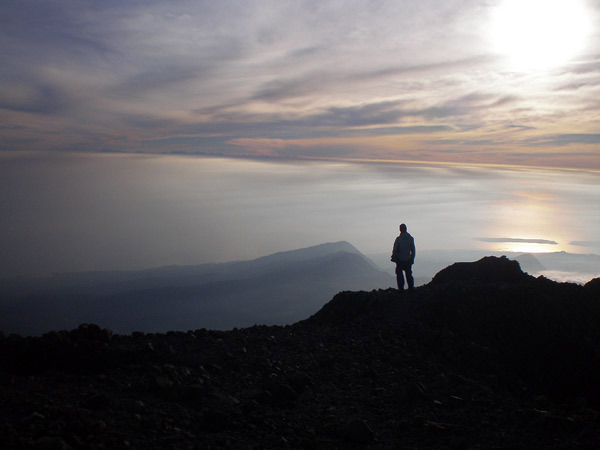 I couldn’t forgive myself for not reaching the bottom of the crater as it was like the main purpose of our coming to that place. So, as not to repeat the same mistake that would make me regret, I said no to Gilang’s idea. Despite the fear that I had, I was fascinated. If they said “two climbs up and one slide down,” I would say the other way around. I started to feel frustrated as to find how difficult it was to reach the summit by walking on the sand. As a beginner, I was advised to walk slowly. But the slower I walked, the further I slid down. I didn’t even realize that the sand had penetrated my shoes. Closer to the summit, I stopped and looked down to the back. I couldn't believe I had climbed that high. 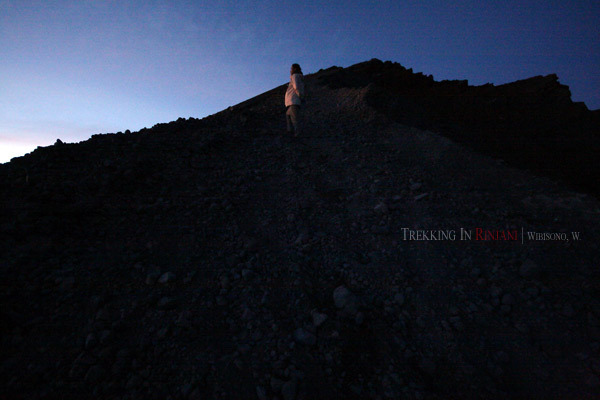 I realized we were far too late to reach the summit (we were supposed to be there at the time of sun rise). The sun was already high. 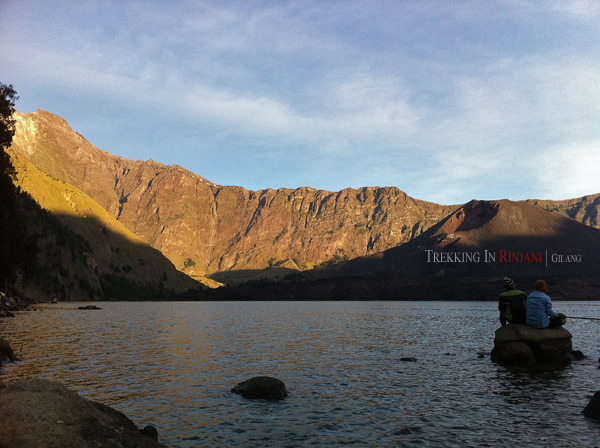 But at least, I did something of what I came to Rinjani for. 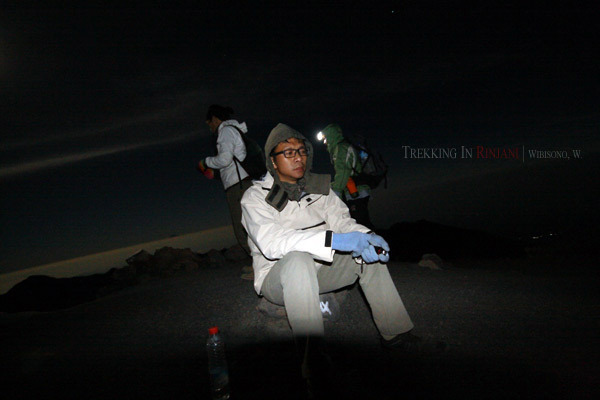 When Gilang and Syaiful reached the summit, I was still coping with the sands and stones which kept sliding every time I walked on them. Reaching the flat ground on top was such a huge relief for me. 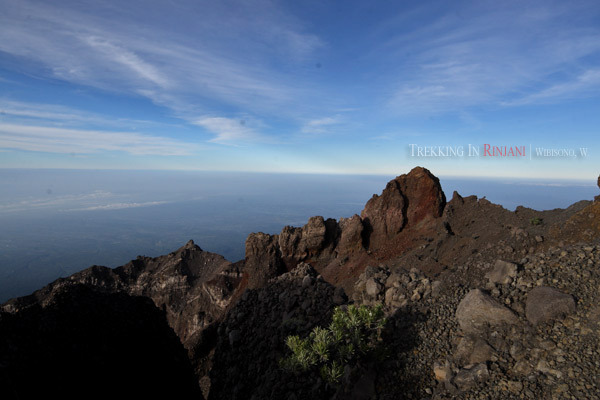 Not only because I became very close to the summit, but also the magnificent view that was like given as a reward if we could reach the top ground. Walking to a bit higher place behind a huge rock, I was finally able to stand on the highest point of the mountain, 3726 meters above the sea level. 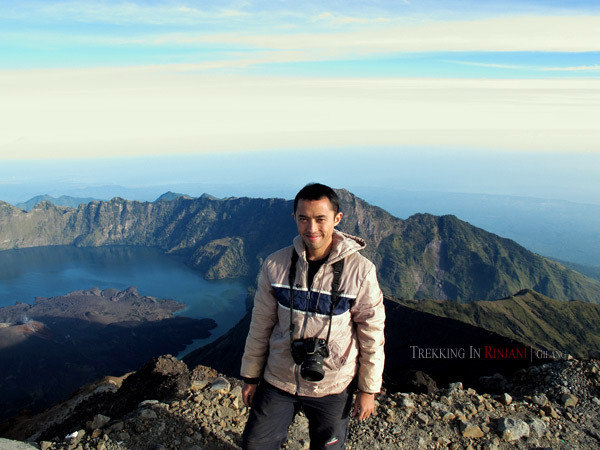 I thanked Gilang very much for taking a picture of me with the amazing background of the lake of “Segara Anakan” and the new volcano down there which the locals called as "Gunung Baru." 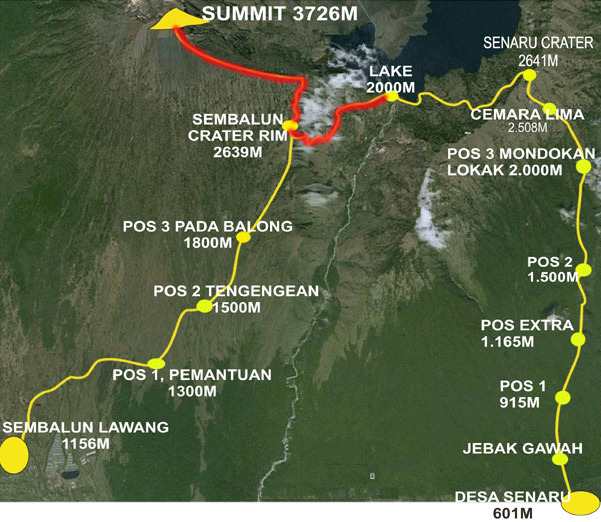 We took several shots from the summit as evidences that we had been there. 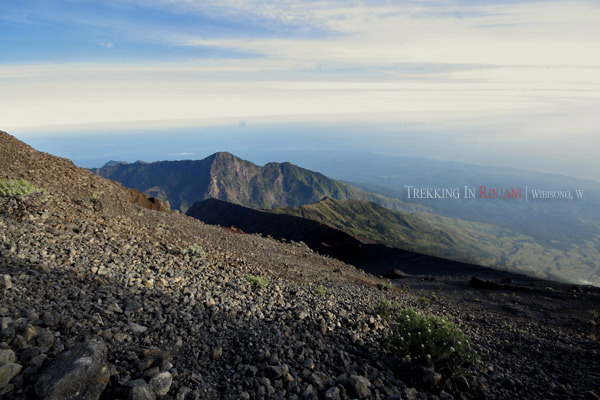 From the summit, we could see the whole part of Lombok Island and the peak of Mount Agung in Bali. 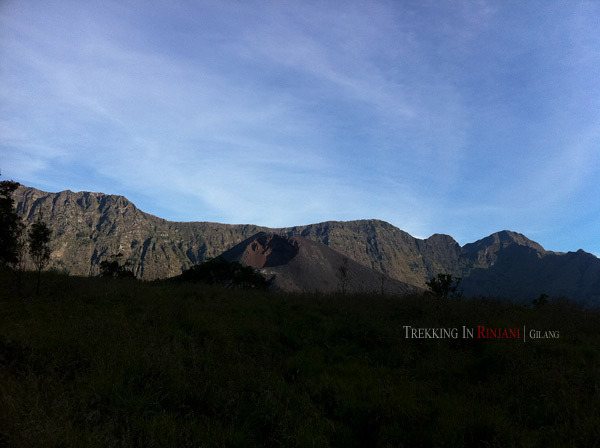 After only few minutes standing on the summit, we walked down, back to the camping ground at Plawangan Sembalun. I could say that climbing down the steep slope was like three times scarier than the previous climbing up. I didn’t feel like walking anymore. It’s like sliding down a huge giant slider with deep ravines on the both sides. I stopped for several times, trying to catch a breath and feel my toes which started to get hurt. At this point, I realized that I might have suffered from dehydration since I didn’t take much water before. 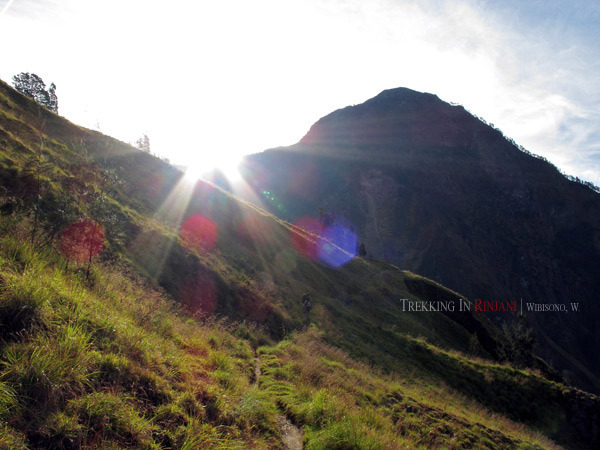 I was left behind few hundred meters by Gilang who was about to reach the camping ground. 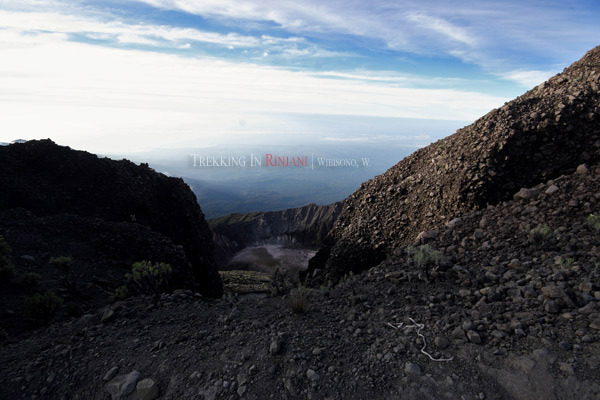 The closer I was to the camping ground, the more I realize that I had hurt my toes as I had hit many stones on the way down. 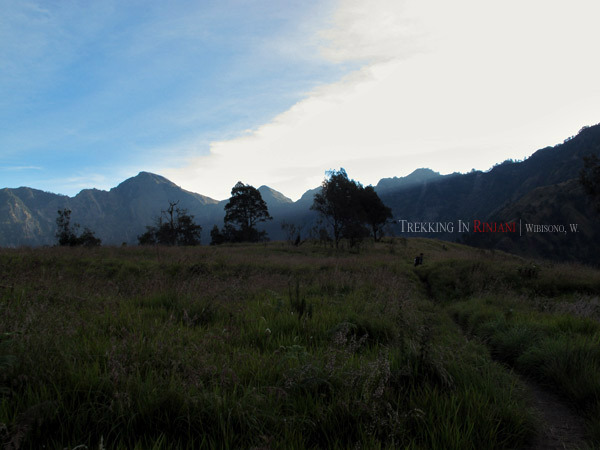 As I entered the camping ground, Gilang handed me a big bottle of mineral water to overcome the terrible dehydration. I sat on the ground, and drank it to quench my horrible thirst. When I took off my shocks, I found bruises in both my toe nails. I guessed they were about to pop out. Gilang advised me to bandage the toes, but I was too stubborn and ignored the advice. I thought it wouldn’t help much. The next trek would be started within few minutes. I kindly begged to have a one-hour-rest before the trek. I knew it wasn’t fair for the rest of us. So, Syaiful took the initiative to divide the group into two. 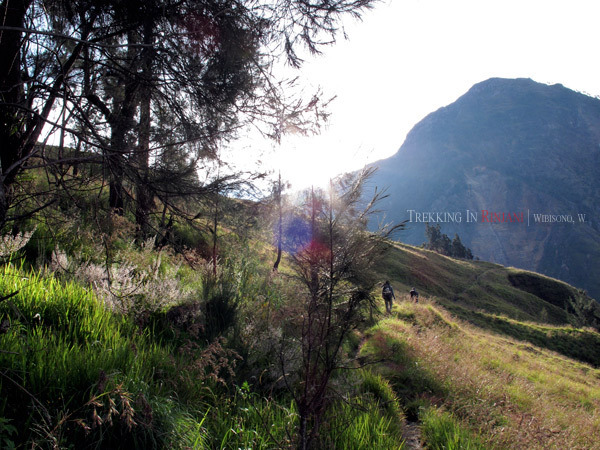 Karen and Patrick could start the trek to the lake, guided by the porters, while Gilang and I would go in the next one hour. Since all the tents had to be carried away by the porters, I slept in a tent belonged to a food vendor. Soon, I fell asleep as I laid my back. Waking up at around twelve o’ clock, I found that it was drizzling outside. 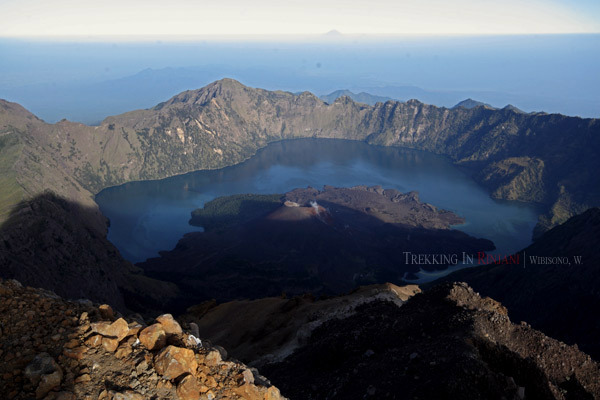 We packed our stuffs, ready for the next trek to the lake which was actually the bottom of the ancient crater. 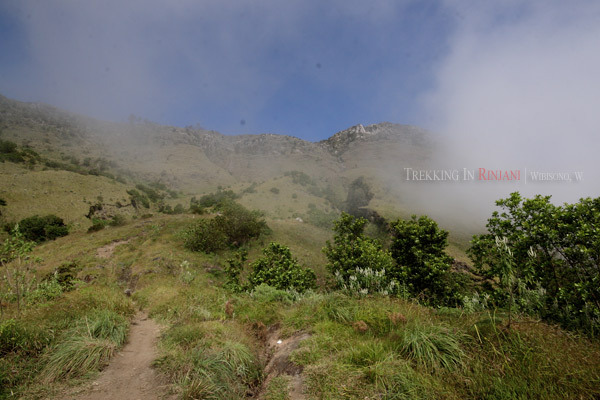 Nearly ninety percent of this trek was about climbing down the extremely steep rocky hills. Walking down on the rocks was like a misery for my toes as they kept bleeding. Perhaps, it was because the new shoes. My friend Tia was right. I was not supposed to put on new shoes for trekking as they might kill the feet. Well, not only the toes, but also the knees and thighs. I could say that it was the most painful trek I had ever had. 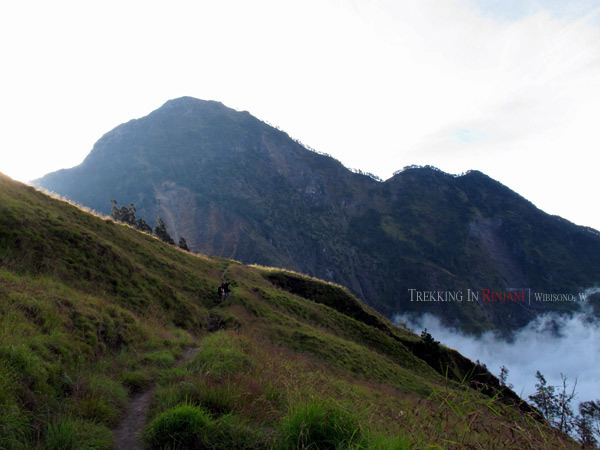 After four hours of climbing down, we reached a point where we could see the cliffs of Plawangan Sembalun above. 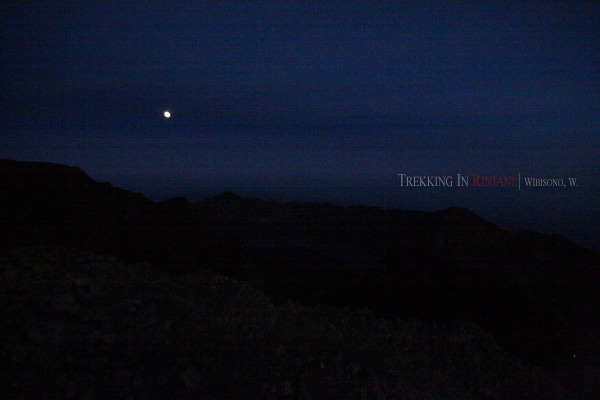 I didn’t take much picture in this trek as I was more concerned with my legs. The happiest part was when I found savannah as I didn’t have to walk on the rocks again. The savannah was very close to the lake, which we reached after about five hours of trekking. Syaiful decided to set up the tents at the lake side and stayed overnight there. The view in that afternoon was absolutely gorgeous. Sadly, I was too sick to take pictures. I was shivering and got a fever. I wrapped my body with jacket and sleeping bag and then went to sleep right away. Meanwhile, Gilang went to the lake to take a bath. He said that the water was very cold despite the bright weather that afternoon. I was glad he took some pictures with his i-phone. 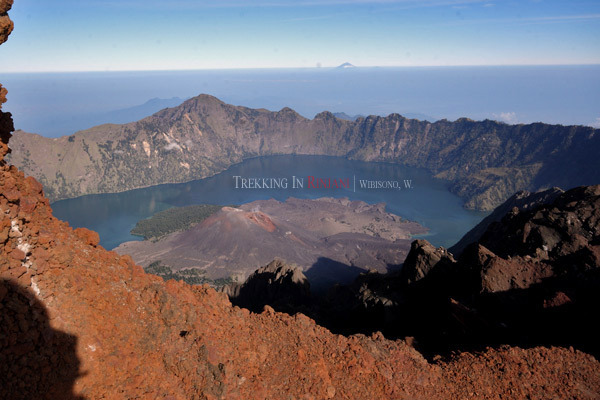 If not climbing down to the bottom of the crater was my biggest regret from the trip to Mount Ijen two years before, I might say that not taking pictures of the lake “Segara Anakan” in that afternoon was my biggest regret from this trip. The only consolation was the fact that I took some mental pictures of the lake. And I believed they would be much more memorable and last longer than the digital ones. 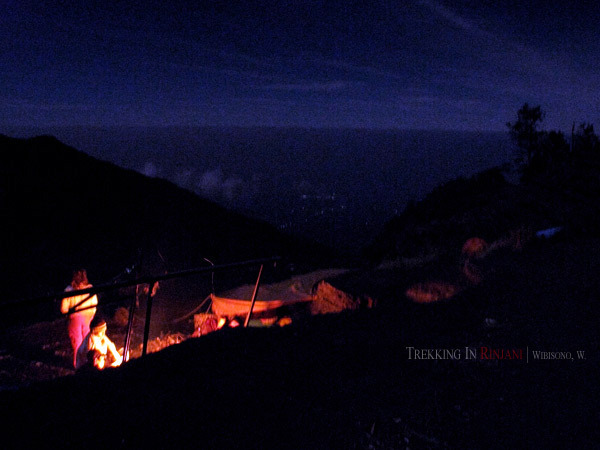 That night I was sleeping like a baby, hoping to get fresh for the last day of trekking on the following day. and when i was sliding down from summit, it was fun and very entertaining. i do downhill run fast and feels like the easiest trekking part. and 1 more, i was not even sleep on that night before summit attack. maybe because i was scared of getting hypothermia. but luckily the wind was nice. Tyo, please check my previous post out. 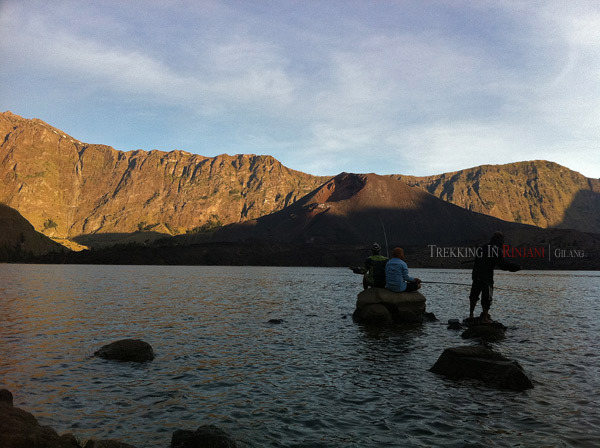 I was wearing a trekking shoes, bought exactly one day before my departing to Lombok. You know, as the saying goes: "New shoes always hurt." Hehe... Next time, I'll buy better ones. Should wear them few weeks prior to the trekking days. Hahaha... I am so sorry my friend. 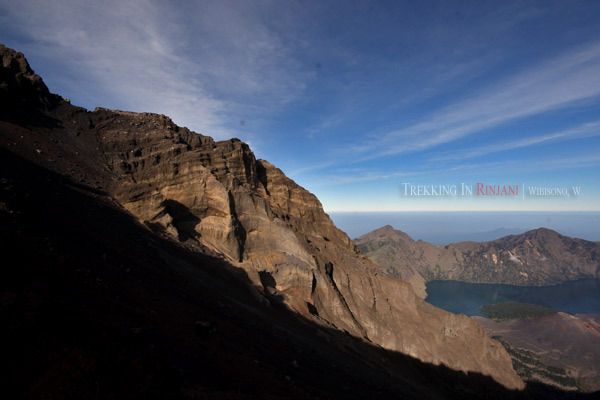 I didn't even remember you said about Rinjani. I thought you said about Larantuka, the Easter festival. 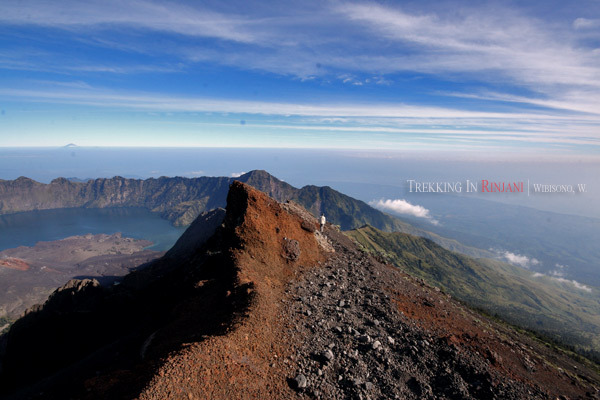 Anyway, Rinjani was like five or six times harder than Ijen. You should try it. Yup! absolutely right. I think it's the most effective and fun way to burn the calories. Haha... actually there were pictures of me in the previous post, only smaller than the one I post here.